What comes to mind when you hear the word stress? For most people they have negative connotations with the word. This morning my training consisted of a good ride on the bike. The plan was to connect with a friend and get in a training session before work. Recently we’ve incorporated a couple of new technologies at Okanagan Peak Performance Inc. This supports our goal for you which is to get you better results in less time. And by incorporating these technologies we know that we will be able to help you recover from your injury, lose more weight and compete at a higher level. Hi there: Hope you’re doing well. This has been a great week. You want to know why? I think it’s because I’ve had great perspective lately. I’ve been really thankful for the good things in my life while not worrying so much about the distractions that can sometimes get us down. It might be the Thanksgiving weekend that has me in this kind of mood but it definitely ties in to your weight loss or performance goals. ‘Ok, hold on a sec’, you’re probably saying. ‘Did he just say Thanksgiving and weight loss goals in the same sentence.’ Absolutely I did. And here’s what I mean by it. Our bodies go through both positive and negative stress. The positive stress is called eustress. Sound familiar? Unfortunately for most people this may be the first time they’ve ever heard of this word. And that says a lot if the positive aspect of stress is so foreign to us we don’t even recognize the word for it. So it would make sense then that the balance tends to be skewed towards the negative end of the stress spectrum. 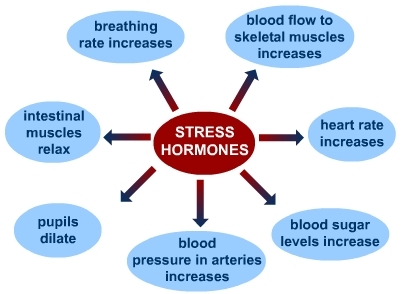 But first we should identify a couple of hormones involved with the stress response. These are cortisol and adrenaline. Adrenaline is the hormone associated with ‘fight or flight’ and results in increased heart rate, elevated blood pressure and boosts energy supplies. We are hard-wired for this response to always be at the ready and thus available to protect and keep us safe. Cortisol is another stress hormone and increases sugar (glucose) in the bloodstream, enhances your brain’s use of glucose and increases the availability of substances that repair tissues. It also alters immune system responses and suppresses the digestive system, the reproductive system and growth processes. Let’s take a quick look at how stress affects digestion, recovery and training. 1. When stress triggers the ‘fight or fligt’ response the body reacts by shutting down digestion. It diverts blood away from the digestive tract to where it’s needed for survival. The muscular contractions of digestion are also put on hold because we may need to do something physical during this stressful event. Lastly, hydration and enzymes normally secreted into the gastrointestinal tract are blocked during stress. 2. With training we can see that we will already have an elevated heart rate due to stress which makes normal training loads feel heavier and recovery times between sets seem inadequate. As our focus is on whatever is causing the stressful episode the ability to perform technical skills will be diminished. The upside, if there is one, is the increased blood flow to skeletal muscles may assist non-technical lifting. 3. When we are stressed our sleep will be impaired as well. Looking back to the ‘fight or flight’ response this puts our bodies at a state of readiness. All systems are put on alert and with increased heart rate, blood flow and breathing rate it’s no wonder we don’t sleep well when we’re stressed. So what can you do about it? Here’s a list of 5 things to reduce stress, increase digestion, improve your workouts and get better sleep. 1. When you don’t think you have time for a break, take one. Going non-stop when you’re stressed leads to poorer quality work, frustration and fatigue. 2. Focus on what you can control and ignore the rest. Recognize those things that are within your control and prioritize them. This way you’ll get the most meaningful tasks dealt with right away. 3. Look for the path of least resistance. This may mean working with those that support you rather than the ones who are usually negative and trying to bring you down. 4. Be a little bit selfish. I said a little bit. And by this I mean you have to take time for yourself. Time to workout. Time to relax and unwind. Your family and friends will understand and support you. 5. Be thankful. It’s surprising how your outlook will change and how much better you’ll feel when you take some time to appreciate the good things you have in your like. The next thing to do is to put time and effort into those things that make your life better. Most of the time all we hear about it is how many workouts, meals and hours of sleep we are getting. I talk of intense, consistent efforts on all fronts. Make sure to balance out the stresses in your life for improved training, digestion and rest.